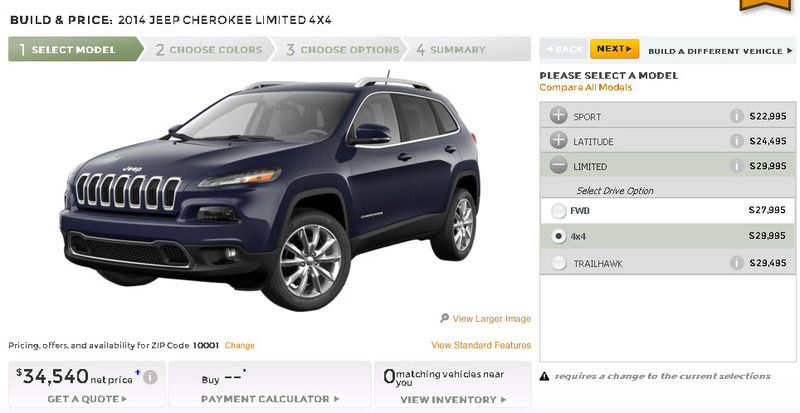 We can now configure the all new Jeep Cherokee online! This answers some questions, like which models have brown seats (the Limited), and what's the price (about $34,000 with the panoramic sunroof and all the technology options). The only model to offer brown seats is the Limited. The seats are actually a volcanic clay and navy blue called Vesuvio (because daddy Fiat said so). However, I know Jeep, and if it's a hit, there will be special editions and probably more colors in the years ahead. But the bottom line remains the vehicle's best feature: This is the world's first crossover with a 9-speed automatic transmission. That, coupled to Fiat's new Tigershark 2.4L Multiair engine, it should get close to 30 miles per gallon, even with four wheel drive. Awesome.